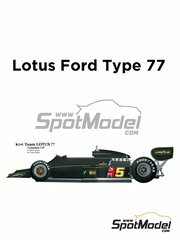 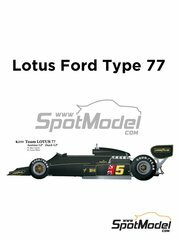 Time limited re-edition of the 1/20 scale model kit of the Lotus Ford Type 77. 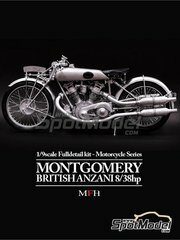 Back to 1920 when the Montgomery British Anzani 8/38hp was born, a gorgeous motorcycle beautifully reproduced in 1/9 scale by Model Factory Hiro. 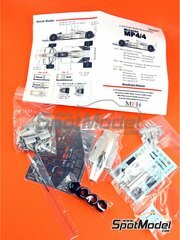 The kit includes hundreds of white metal, rubber, photo-etched and chromed parts. 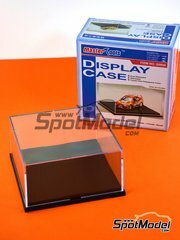 Plastic case measuring 117 x 117 x 52 mm. 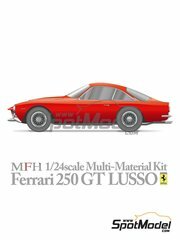 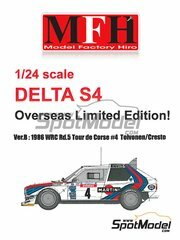 It is absolutely perfect for 1/43 scale cars, 1/144 scale aircrafts, or small dioramas in 1/87 scale. 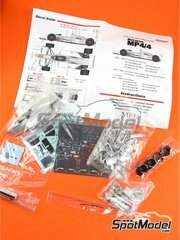 Decals for complementing the decoration of the MP4-30 just like it raced during the season finale. 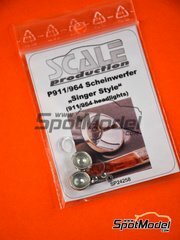 The optics used by the renowned car tuner Singer in their Porsche 911 evolutions. 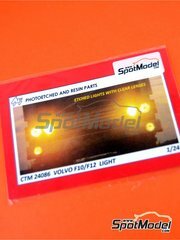 Photo etched parts with a dip of transparent resin, for using on Volvo F10 and F12 trucks, helping you to give much more depth to the front lights of your truck. 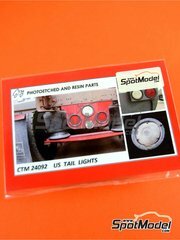 Wonderful photo etched parts with a dip of red dyed transparent resin, exactly reproducing the ones used in the rear side of American trucks and trailers. 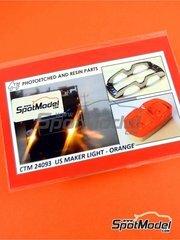 Orange marker lights like the ones used in America trucks. 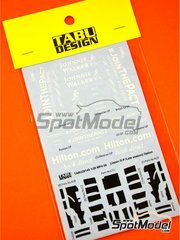 Photo etched parts include a dip of orange dyed resin, giving these parts a hugely realistic feeling. 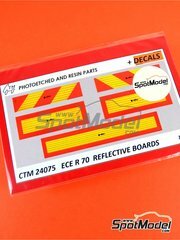 ECE R 70 regulation compliant rear reflective boards, such as the ones used in trucks, buses and trailers. 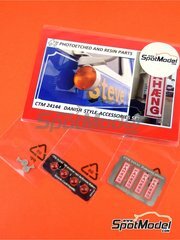 Indicators and "Ahæng" plates, such as the ones used in Denmark on all kind of trucks and trailers. 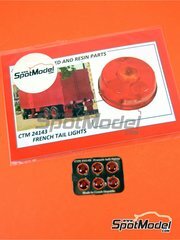 Oval shaped indicator lights, recreating the 6.5 inch indicators used in trucks and vans. 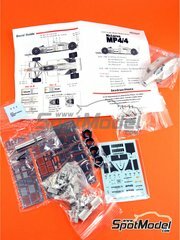 Photo etched parts including a red/orange dyed transparent silicone dip, precisely recreating the ones used in french trucks and vans, as well as all kind of classic vehicles. 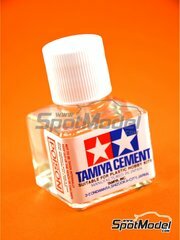 The most classic and renowned Tamiya glue, in 40 ml glass bottle. 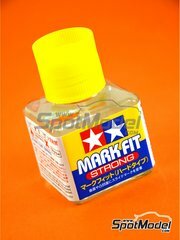 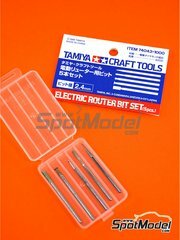 It is used to glue the plastic parts of your model, and it is recommended for experienced modelers who need a liquid glue to join parts without any adhesive remains. 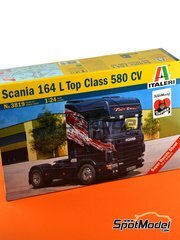 A huge Scania 164L scale model kit including, among many other parts, a fully detailed engine, a tiltable and incredibly detailed cabin, and a impressively thorough decals sheet.